When I returned to Aden I asked if it would not be possible to punish at least one of these plunders of peaceful caravans, so that the land, now restive and doubtful, might settle down to a reality of peace: but though everyone agreed with the necessity, there was great reluctance…owing to the constant burden of criticism at home. Aden once called the “eye of Yemen” sits on the Gulf of Aden which flows into the Arabian Sea and at the strategic entry point to the Red Sea. Yemen controls the eastern side of the Bab al Mandeb choke point at the southern end of the Red Sea. 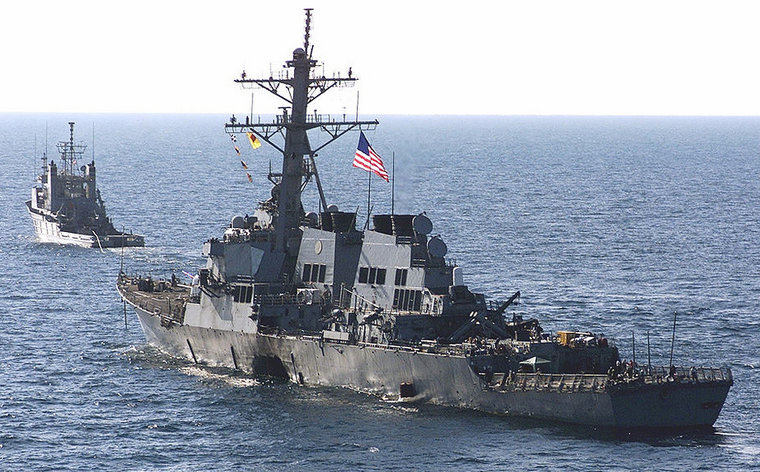 Fifteen years ago, Al-Qaeda terrorists in Aden attacked the USS Cole (DDG 67). Looking back at Yemen and what Al-Qaeda was doing in this country, the attack on a Navy warship should have surprised no one. In a Med-Arabian University brief given sailors aboard the USS Cole, Yemen was listed as having a high threat level. Early on Osama Bin Laden thought of Yemen as a country where Al-Qaeda could freely recruit and as a safe haven. In 1998, Bin Laden stated in an interview, “In Yemen we have strong and old links, by the grace of God Almighty, besides the fact that my roots and my father’s roots go back there.” Al-Qaeda’s recruiting prowess in Yemen is evident when one looks at the number of detainees still being held in Guantanamo Bay. Yemen ranked third behind only Afghanistan and Saudi Arabia of the more than 45 countries that had citizens sent to Guantanamo. Today of the116 detainees still held in Guantanamo Bay 70 are citizens of Yemen. And with the civil war going on in Yemen today there is no hope of returning the Yemeni detainees being held at Guantanamo Bay. Yemen porous borders, weak central government and unrest among the various tribes has made Yemen a country where Al-Qaeda can still recruit and develop capabilities. Al Qaeda in the Arabian Peninsula (AQAP) is one of the most dangerous terrorist groups in the world. Bin Laden’s father was from the “village of al-Rubat in the Hadhramaut area of northwest Yemen.” For years Al-Qaeda has taken advantage of Yemen’s long history of violent unrest between the tribes and the government and relied upon the protection of numerous tribes. The State Department’s Patterns of Global Terrorism: 1999, on Yemen noted that the “lax and inefficient enforcement of security procedures and the government’s inability to exercise authority over remote areas of the country continued to make the country a safe haven for terrorist groups” Al-Qaeda in the Arabian Peninsula (AQAP) operates within this same framework that was noted in this State Department report. The Al-Qaeda Platform in Yemen continues to be a safe haven, and a transit point to move personnel and materials. AQAP taps into tribal smuggling networks to move people and materials both north and south to and from the Kingdom. The Africa-Yemen smuggling trade continues to flourish giving AQAP access to Africa. . Given its geographical proximity to the Horn of Africa and its borders with Saudi Arabia and Oman AQAP continues to take advantage of Yemen’s gateways. More importantly this platform allows Al Qaeda to plan and execute attacks within the country as well as externally. While Al-Qaeda’s first major attack in Yemen was the “Boats Operation” we will continue to see AQAP continue to launch various types of operations from Yemen. The failure of the United States to take decisive action against Al-Qaeda and Osama Bin Laden after the attack on the USS Cole only emboldened Al-Qaeda. Unlike in 1998 when President Clinton launched a cruise missile strike against the Al –Qaeda training camps this time there was no response. Osama Bin Laden thought the US was going to retaliate by bombing Al Qaeda’s leadership and training facilities in Afghanistan. Bin Laden in anticipation of US attacks after the Cole suicide bombing ordered much of the Al Qaeda leadership to go to ground. Bin Laden took additional security measures moving often and never sleeping in the same place. He dispatched his deputies to different cities. But the US did not follow up with an attack. In the spring of 1999, Abd al-Rahim Nashiri had the approval of the Al-Qaeda Military Committee to undertake a maritime attack in Yemen. Nashiri wanted to attack a U.S. Navy warship refueling in Aden harbor. Khallad Bin Attash (Tawfiq bin Atash) and Salman al-Adani began conducting initial casing and surveillance of ships in the Red Sea port of Al-Hudaydah. Badawi and his brother went out in a fishing boat and conducted the same surveillance of ships in the port of Aden. In the spring of 2000, Khallad Bin Attash was picked up by the feared Political Security Office (PSO). Once Khallad was released, Bin Laden had him return to Afghanistan since he didn’t want the PSO to learn about the Boats Operations. With Attash back in Afghanistan, Nashiri was in charge of the Boats Operations and had to assemble personnel to undertake this operation. In 1999, Nashiri gave Jamal Ahmed Mohammed Ali Badawi a letter from Khallad Bin Attash stating that Badawi was to assist him in this operation. For his first assignment, Badawi went to Jizan, Saudi Arabia and purchased a small white boat and had the boat delivered to the Shabwa gas station in Al-Hudaydah. Badawi did not want to buy a boat in the place where the attack would take place. Badawi then contracted to have the boat moved to Aden. In November 1999, Nashiri and Taher Hussein Tuhami travelled to Al-Hudaydeh to pick up a Yamaha 200 horsepower outboard motor that Tuhami had purchased. They needed an engine that would power a boat packed with explosives. Khallad Bin Attash next sent Nashiri another terrorist name Fahd Mohammed Ahmed Al-Quso. Quso had trained in a number of Al–Qaeda camps and was a frequent visitor to Al-Qaeda guesthouses in Afghanistan. He was assigned to be part of the boats operation in Yemen. In January 2000, Quso left Yemen to act as Al Qaeda’s courier carrying over $30,000 that he passed to Khallid bin Attash in Bangkok. Quso travelled to Malaysia where he and Attash met with September 11th terrorists Nawaf al-Hazmi and Khaled al-Mihdhar. Quso returned to Yemen after the delivery of money. Quso had learned of the attack on the Cole “a month and a half beforehand.” Badawi had asked Quso to help recording the attack on the Cole. Badawi took Quso to the Tawahi apartment and showed him how to use the small Sony camera. Badawi stated that the attack would take place at one of the two fueling stations in the harbor. Badawi gave Quso a key to the apartment and a pager and told him that he would page him “010101” letting him know the attack was imminent. The U.S. Navy had negotiated a contract to refuel its ships in Aden Harbor in 1998. The refueling contract allowed Al-Qaeda the opportunity to conduct surveillance and learn the security posture and the procedures surrounding the fueling of American warships. From 1998 to 2000 more than two dozen warships refueled in Aden. This gave Al-Qaeda plenty of opportunities to master the procedures. Al-Qaeda operatives had already conducted their initial casing and surveillance of ships entering the port of Aden. Next, Nashiri needed a base of operations that provided a vantage point of ships entering Aden harbor. In the summer of 1999, Badawi found a residence in the Madinat al Sha’ab area of Aden, Yemen that provided privacy. Nashiri leased the property for six months under the name Abda Hussein Mohammed and had a gate added to the compound. In December 1999, Nashiri rented the second floor of a house in Al- Tawahi District which overlooks the harbor in Aden. Nashiri rented the apartment for four months and paid the rent in full. A third safe house would later be added to the other two. At one point the terrorists had to build up the fence around the safe house with corrugated metal to deny neighbors a view into the compound as they prepared to work on the bomb in the boat. Terrorists need to conduct detailed casing and surveillance if they are to be successful. Without these pre-incident activities they will often not be successful. Nashir’s Aden cell was able to acquire funding, personnel, explosive materials, vehicles, as well as conduct surveillance and conduct a test run launching their boat into Aden Harbor. They also learned lessons that they applied after their first failed attempt to attack the USS Sullivans. On January 3, 2000, an American warship the USS Sullivans, an Arleigh Burke class “Aegis” guided missile destroyer sailed into Aden harbor to refuel. Immediately Nashiri put his plan into action. Nashiri and others moved the explosive pack boat to the harbor. When Salman al-Adani and Taha al-Ahdal, the two suicide bombers pushed off from the shore the explosive packed boat sank. The next day Nashiri and others returned to salvage the boat and the explosives. But as with all things when things go wrong there is a cascading effect. When the terrorists returned they found out that some local fishermen had already made off with the outboard motor. Nashiri would have to negotiate and buy his own outboard motor back. The US would not learn of this failed attack on the USS Sullivans until they were interrogating a suspect in the Cole bombing in November 2000. From this failed attack the Aden cell would go back and refit the boat and conduct a test run with the boat in the harbor. They clearly didn’t want to fail a second time. The “Boats Operation” started with the attack on the USS Sullivans, then the USS Cole, and finally the attack on the French tanker MV Limburg. During this period Al-Qaeda was pushing the organization’s envelope having developed two different attack capabilities-boats and planes. We stress the importance of martyrdom operations against the enemy, these these attacks that have scared Americans and Israelis like never before. Al-Qaeda has used ideology and religion to create a culture within the organization that supports and strengthens the use of martyrs. Al-Qaeda has used individuals to identify a potential martyr similar to a talent scout. The potential martyr would then be “pitched” to gage interest as a suitable candidate and then recruited for a potential military mission. The potential martyr would then be trained. During or after training the individual would be evaluated to pledge bayat and potentially join Al-Qaeda if deemed appropriate. All of this could take place locally in Yemen or elsewhere with Al-Qaeda identifying martyrs for a potential operation. Secrecy and cloistering the martyr have been two strong themes that continue to be seen in this process. The martyr would believe his glorious death would allow him to enter paradise and escape frustrated ambitions and social problems on earth. Yemen is the perfect place to recruit martyrs. The two suicide bombers for the attack on January 3, 2000 were Salman al-Adani and Taha al-Ahdal. But they would not be used for the attack on the USS Cole. The two suicide bombers that attacked the USS Cole were Hasan Sa’id Awad al-Khamiri (Kunya-Abu Ali) and Ibrahim al-Thawr (Kunya- Nibras). Hasan al-Khamiri was from Shabwah Province and Ibrahim al-Thawr was from Sana, Yemen. On the morning of October 12, 2000, the USS Cole entered Aden harbor to refuel. At 0746 a.m. the harbor pilot, Ibrahim came aboard and began the process of guiding the warship into Aden harbor. By 0849 a.m. the warship was moored starboard side to Refueling Dolphin # 7. The harbor pilot departed the Cole by 0940 a.m. and the crew began the process of refueling at station three at 1031 a.m. Hasan al-Khamiri and Ibrahim al-Thawr launched the boat packed with explosives from Al-Haswah Beach. The two suicide attackers slowly started to make their way on the water pass fishing boats in the harbor. Two small boats had retrieved the trash from the Cole. The Cole was only going to be in port long enough to drop its trash and refuel. According to a Petty Officer on the Cole, “A few minutes before the blast on October 12, 2000, the X.O. made an announcement on the 1MC stating that we should be completed with fueling and expecting to get underway by 1330 and if possible we would get underway sooner.” The two suicide bombers guided their boat to the port side amid ship and then waved, smiled, saluted and detonated their device. The crew worked diligently to assist the injured and save their ship. Much credit for this must go to Commander Kirk Lippold. Cmdr. Lippold trained his crew to be able to handle various critical incidents. In reality the warship should have sank twice. But the Captain and crew would not allow that to happen. The fact that the Cole was not on the bottom of the harbor is a testament to their efforts. Seventeen sailors lost their lives that day and another thirty-seven were wounded in action. The USS Cole is named for Marine Sergeant Darrell Cole, who was awarded the Medal of Honor for conspicuous gallantry in the battle for Iwo Jima. Like their ship’s namesake, the sailors of the USS Cole displayed great courage on October 12, 2000, aiding their wounded and keeping their ship afloat. Who would have thought that fifteen years later justice would still not be served on the two masterminds of this attack. Khallad Bin Attash and Abd al-Rahim al-Nashiri today sit in Guantanamo Bay awaiting the slow grind of justice. Justice has come more swiftly for some like Abu Ali al-Harithi and Fahd al-Quso, who were killed in predator drone strikes in Yemen. On May 6, 2012, Fahd al-Quso was killed in a drone strike as he got out of a vehicle in Rafd, Shabwa Province. Others like Hadi Muhammad Salih Ibada Dulqum al-Waili (Hadi Dulqum) who acquired the explosives used in the attack on the USS Cole and Jamal al-Badawi have evaded justice for now. Badawi escaped from Yemen prisons twice, the second time being on February 3, 2006 along with 12 other Al-Qaeda members. He surrendered to Yemeni officials and was later released on his pledge not to engage in violence. There is still a $5 million dollar Reward for Justice being offered for information leading to his capture by the United States. Today Yemen still remains a platform that Al-Qaeda continues to utilize to launch attacks not only in Yemen but globally from this terrorist safe haven. Fifteen years from today will Yemen still be a terrorist platform? Yemen today is in such chaos. Former President Saleh and the Houthis rebels control much of northern Yemen and are supported by Iran. President Hadi, had to flee Aden for Saudi Arabia at one point, but his military forces back by Emirate armor and Saudi Arabia’s Air Force have made gains toward the capital of Sanaa. But this civil war has created a refugee problem and offers AQAP a sanctuary in the western provinces. The lesson we need to learn and implement is how we ensure that a country like Yemen does not become a platform and safe haven for terrorists. If we do not master that lesson we will continue to see terrorist groups pushing the envelope and seeking creative ways to attack US interests worldwide. Fifteen years is too long to waiting for justice. Political excuses and a lack of expediency highlight how we have failed to secure justice for those who lost their lives aboard the USS Cole. We owe them and all the brave sailors who saved that ship almost fifteen years ago. On May 2, 1945, President Harry Truman issued Executive Order 9547 which by virtue of the authority vested as President and Commander in Chief of the U.S. Military under the Constitution appointed Supreme Court Associate Justice Robert Jackson as Chief of Counsel tasked with trying those Nazi leaders accused of war crimes. On October 7, 1946, Justice Jackson reported that the International Military Tribunal sitting in Nuremberg, Germany found 19 of the 22 defendants guilty and acquitted 3 individuals. Justice Jackson mentioned the “magnitude of the task” that was under taken. But the magnitude of trying two terrorists being held in Guantanamo Bay for attacking a U.S. warship seems larger than trying Nazi war criminals. I seriously doubt, William Gladstone, the English barrister and former Prime Minister was thinking fifteen years when he said “Justice delayed is Justice denied. President Truman after World War II appointed one of the most able minds in the American legal system to secure justice. President Obama stated in his first State of the Union that “there is no force in the world more powerful than the example of America.” Since coming to office, too much time has been spent on the politics of closing Guantanamo Bay rather than how Justice might be that American example for the world. Let’s not delay Justice any longer. We owe this to all who served on the USS Cole. Every day Americans in uniform place themselves in harm’s way. While no words can soften the grief of loss we must remember to honor those members of the USS Cole that have paid the ultimate price for our freedom. Remember to keep them and their families in your thoughts and prayers.